Simon and I don't often venture into Jesmond in the evening, probably because we prefer the convenience of being in the centre of Newcastle. It's all too easy for us to forget about all of the great bars and restaurants there are in the lovely little suburb. 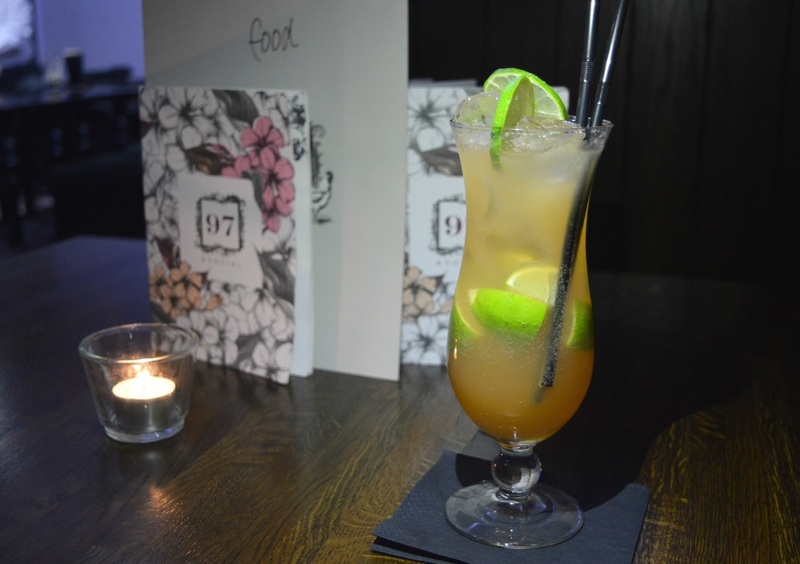 Last week we decided to have a date night and headed to 97 & Social because why should students get all of the fun in Jesmond? 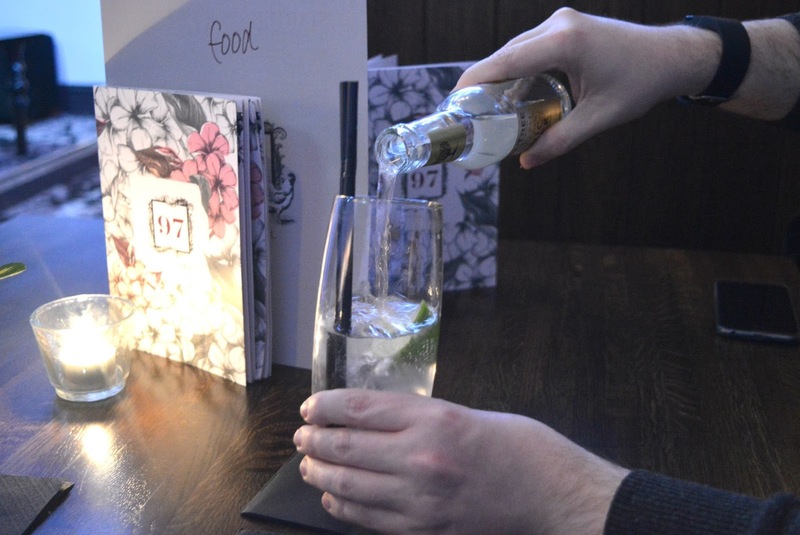 97 & Social have recently launched a new food menu which, although still small, is perfectly formed. There's a wider selection of food than before including the rather tasty additions of Rotisserie, Pie 'n' Mash and Burger menus. The bar was packed out so we were happy we'd booked and pleased when we were shown to a little booth hidden away at the back of the bar. We immediately focussed our attention on the cocktail menu. After all, cocktails are what 97 & Social are known for and I'm such a fan of their extensive cocktail list. Simon decided to create his own G&T, something that seems to be very popular with a fair few bars in Toon now offering something similar. There's a good choice of gins on the menu with ten to pick from and then seven tonics to pair with, including local favourites Fentimans. It's the fruit garnish that always captures my imagination and there's a great choice of twists and slices at 97 & Social to give your drink the perfect finish. I was a little disappointed when Simon opted for a lemon slice, I would have gone for something a little more unusual - maybe some rose petals, cherry or perhaps even coffee beans. We were pretty tempted by the Starters and Sharing menu but as always wanted to save ourselves for dessert so decided to skip the first course and head straight for Mains. 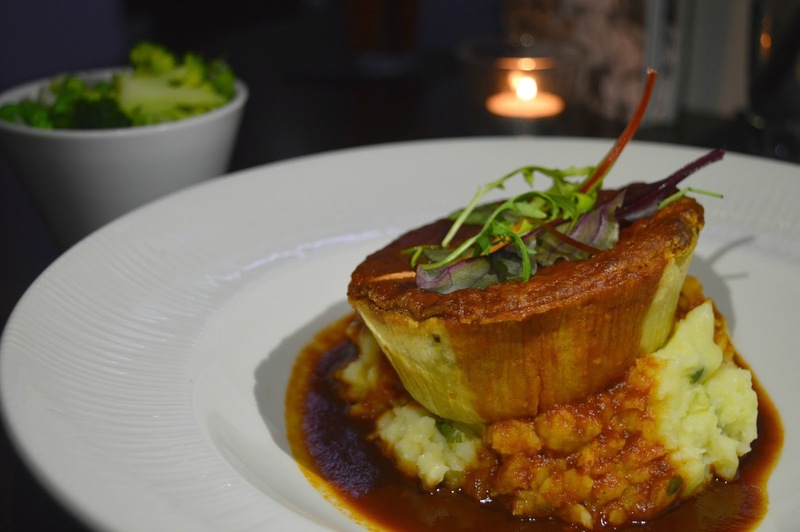 The Pie 'n' Mash menu had "Chloe" written all over it so I picked the Spinach and Goats Cheese Pie paired with Spring Onion Mash (the choice of 4 different types of mash was tough for indecisive old me!) I was slightly overwhelmed by the amount of food on my plate when it appeared. But forever a slave to my tummy I was determined I'd fit it all in somehow. The pie was a little stodgier than I was expecting but still delicious. 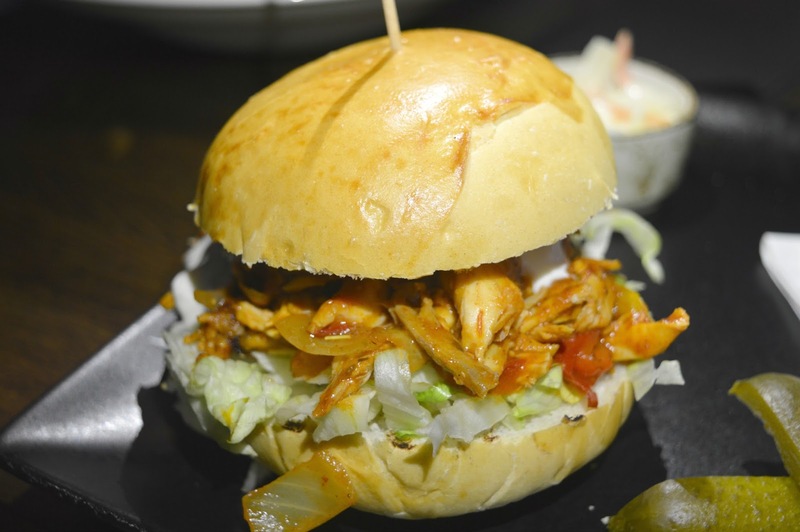 Simon decided to turn his attention to the "Burgers" part of the menu and ordered a Pulled Cajun Chicken Burger which came topped with roasted pepper, spicy salsa and soured cream. Usually the expert in eating his burger without making any mess, this one was so stuffed full even he couldn't master it. I watched rather smugly as his burger turned into a big juicy pile of filling and sauces. The burger had a bit of a punch to it so definitely not something to order if you're a spice wuss like me. I had a little bite and it was delicious but a little too hot for me. Simon on the other hand really loved it and ate every last bit. The dessert menu at 97 & Social is very small with only two dishes to choose from but as two of our favourite dishes feature there were no complaints from us. 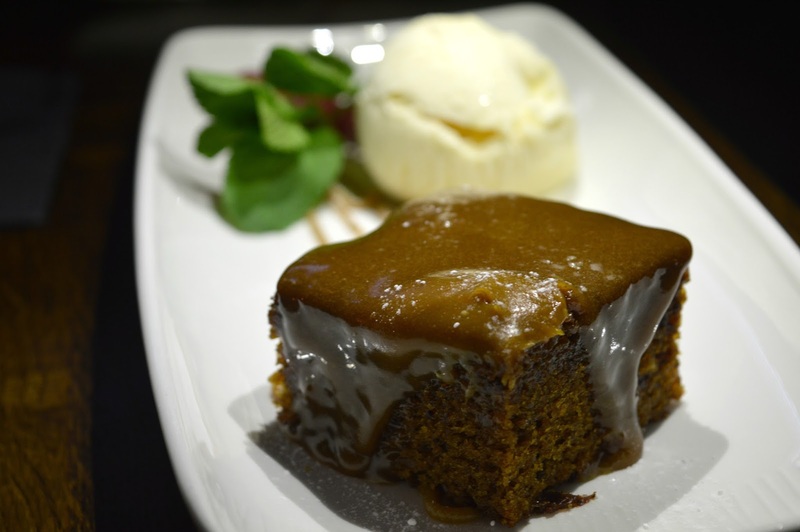 Simon had the Sticky Toffee Pudding with toffee sauce and vanilla ice-cream. I managed to wrestle a little bit off him and it was delicious, I was pretty jealous I hadn't picked it for myself. As we finished up our food and watched the students in fancy dress weaving their way round the bar we decided we were feeling a little sleepy after our feasting and that we were perhaps a little too old to stay at the party too much longer. 97 & Social was a welcome break from the kind of places we usually eat and we loved the atmosphere and people watching but we were definitely ready for bed! Let me know if you have any other recommendations of bars or pubs that do great scran. This looks amazing! I like the sound of your goats cheese burger - anything with goats cheese in is always a winner with me! 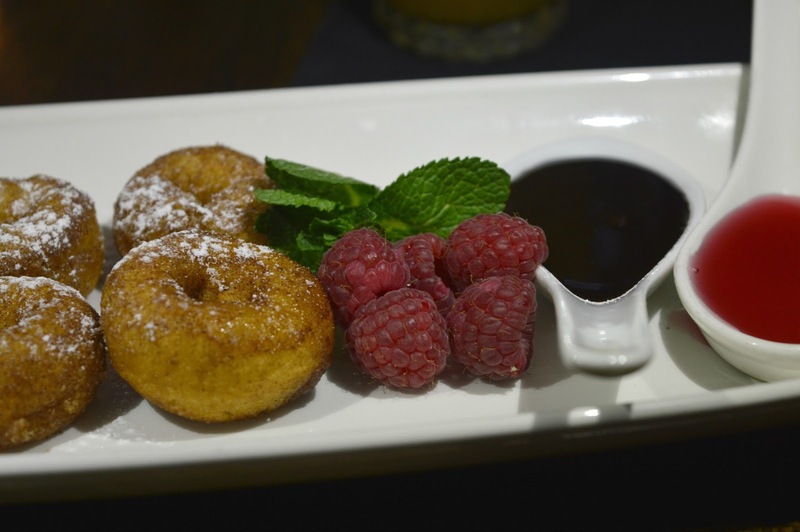 We tried The Botanist in Newcastle a few weeks ago which was amazing! I'm loving the sound of goats cheese and spinach pie! Sounds fabulous- I'm off to check the menu out now! Even as a tea totaller, I love the idea of creating your own G&T... Love the idea of rose petals in it too! Looks fantastic, I always dismiss Jesmond as I assume its still the student capital of the universe, but I really must go there more often!